About a year ago, my newest piece, Face Time started taking shape. 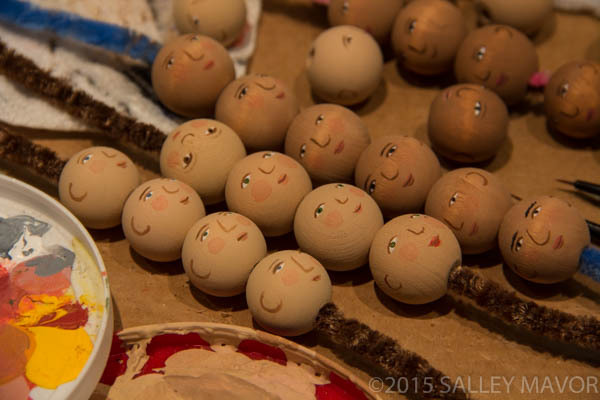 I took pictures along the way, during the many months that its collection of little heads occupied my work table. The piece was completed this past winter after about 6 months of work. I’m often asked how long it takes to make a large piece like this (24″ x 30″). It’s hard to say for sure, because my days are interspersed with so many other activities (and distractions) having to do with the business side of being an artist. Of course, I’d rather be stitching every day in my studio, but I fear that would lead to an obscure life, without a presence beyond my studio walls. I’d guess that at least 50% of my work time is spent promoting my art in some way; e-mails, interviews and other publicity, Etsy Shop, editors and publishers, social media, entering and arranging exhibits, etc. OK, that’s enough of a reality check–shall we stick with the romantic notion of spending all day stitching in a window seat? I’d like to take you through the making of Face Time, so you can have a sense of what’s involved. If you’ve read my post, When to tell how and when not to, you’ll know that I don’t always show my process, but this is one of those instances when I’ve taken enough photos to warrant a 3 part series. I’m excited to share the new direction my work has taken! 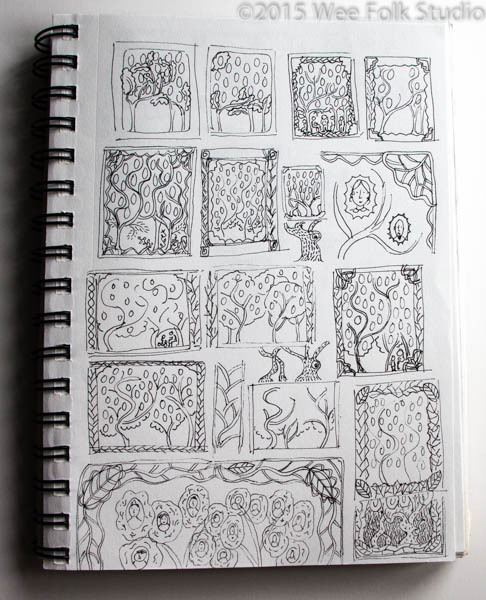 For Face Time, I started in the usual way, thinking about the idea for a long time before jotting down itsy bitsy drawings in my sketch book. While I work, the concept remains strong and constant, while the overall design changes with time. I also consider how the parts will be rendered in embroidery and 3 dimensional needlework. I wanted to show different people from all over, evolving through time, from long ago civilizations at the bottom, to present day people at the top. 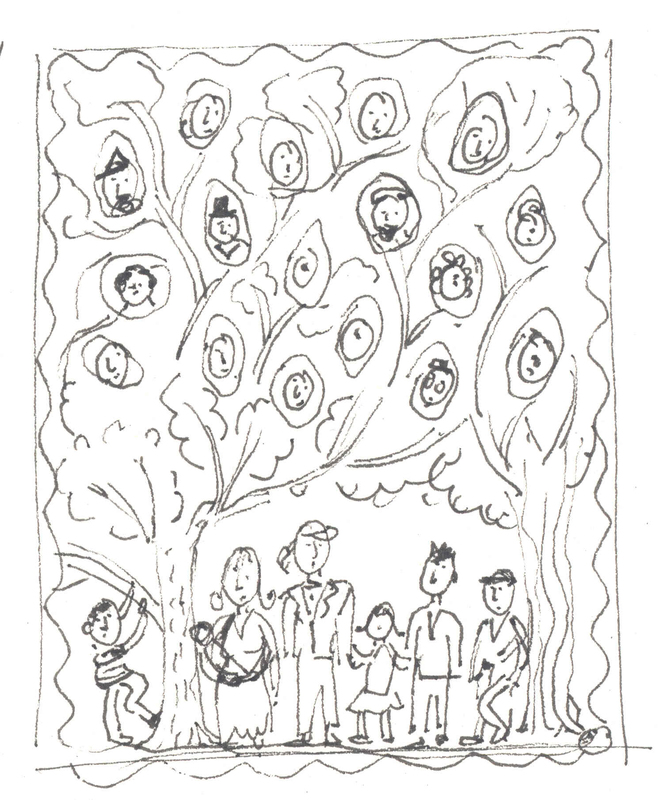 I wasn’t so interested in making a personal family tree, but a depiction of the world’s collective heritage. 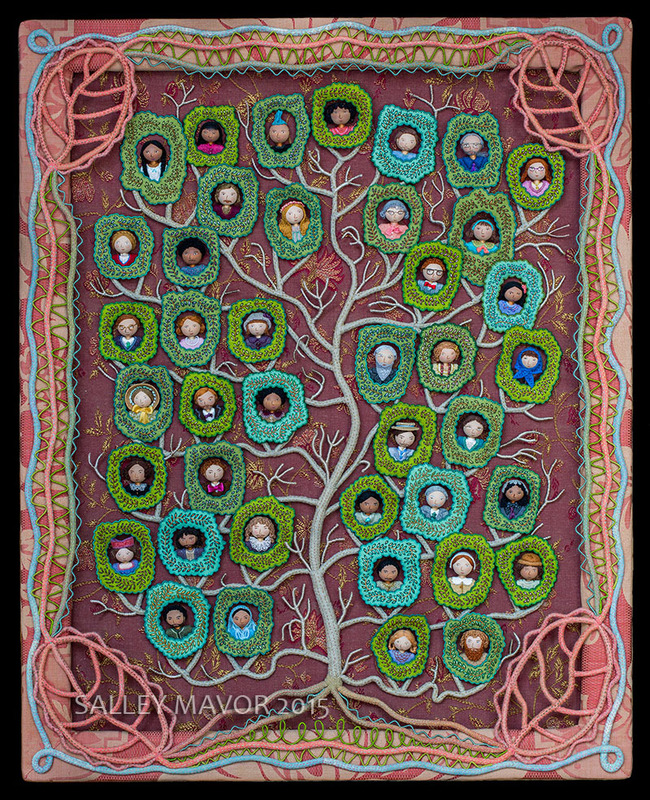 I envisioned a group of faces from a variety of backgrounds and cultures peeking out of the greenery, all linked to a tree-like form. Researching fashion history was very fun! Online, I found pictures of hair styles, beards, hats and garments. In addition to wigs and painted facial features, each wooden head had a bit of clothing showing at the neck and shoulders. 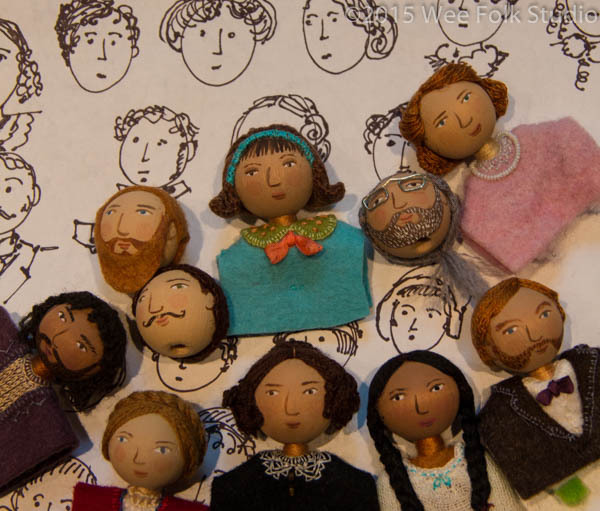 They expand on the wee folk doll projects from my how-to book, Felt Wee Folk – New Adventures. Wire glasses were something new, which I thought contributed to the individuality of some characters. 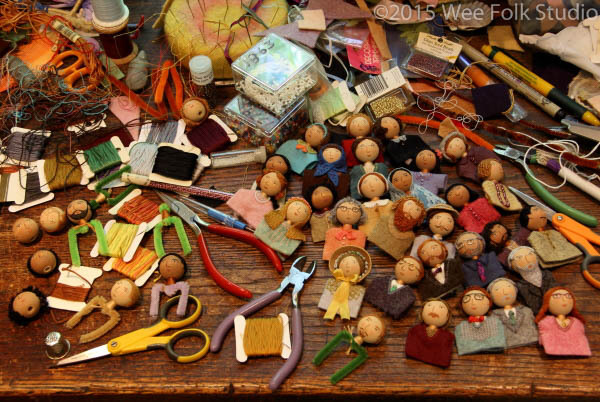 Over a period of many weeks, the heads grew in number, filling my modest work table. There ended up being 41 heads in all, covering many centuries. Here they are, in a group shot, before they were separated by leaves and branches in the finished piece. I will show more about that in part 2. 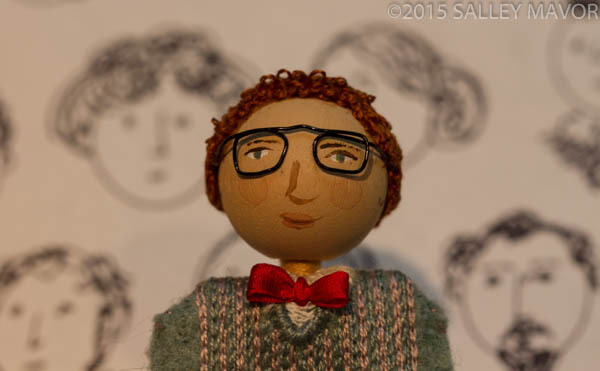 This entry was posted in Dolls, Fabric Relief, Face Time, Wee Folk by Salley Mavor. Bookmark the permalink. Fascinating process. I so appreciate how much you share. I wish I lived closer to see some of your work in person. Your work has really influenced my own stitching. Thank you so much. I wish you would consider teaching. I would love to take a class from you. Thank you Linda, for being such a devoted follower and I hope that you will have the opportunity to see something in person in the future. As for teaching—sorry, but it’s not going to happen. At this stage of my life, I realize that I can’t both teach and be an artist, so I choose to make art. Thank you for the wonderful photos and dialogue. Your process for your artwork is so inspiring. I was wondering if you have ever considered some tutorials for yours Birds of Beebe Woods? I would love to know how to produce some birds, certainly not the ones you do as they are “yours”, but I’m talking about the “genre”. You have a set a standard that is so awe-inspiring and the photos that you have shared are incredible. I’ve taken a Sue Spargo class on Craftsy.com and it has been fantastic for my hand embroidery. Time consuming, yes, but well worth the effort for the end product. Your e-mails are such a welcome sight on my computer and I’m so happy to have signed up. Hopefully, if Birds of Beebe Woods ever gets to a display point in the West, you will let us know, and I will be there. Thank you so much for your interest in my work Carole. As I explain in this post, https://weefolkstudio.com/2015/04/14/when-to-tell-how-and-when-not-to/ , I’ve come to the conclusion that I can’t both teach and do the work of making new art. But, posts like this one about Face Time will happen from time to time. And yes, perhaps the “Birds” piece will fly out west in the future! Salley, what a wonderful new project. I can imagine your mind racing from one face to the next, excited about the fun of all the details. You are so kind to show your thinking and process. You are so inspiring!!!!!! 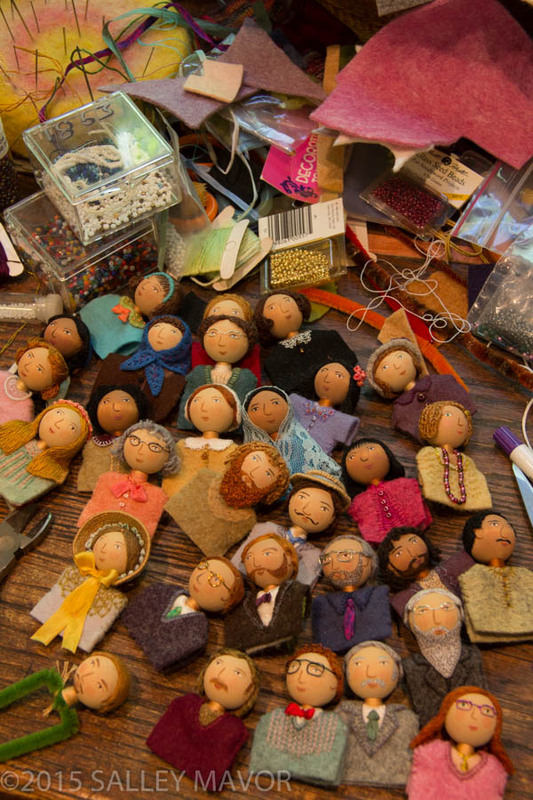 How did you keep track of where each head or even clothed piece went when they were clustered on your workspace? I expect you spent enough time with each that you had it strong in your head, but I am sure you had to be really careful when it came to similar looks over the ages. Yes, Sandy, I spend a lot of time getting to know each character, so they are pretty much all unique. And they don’t seem to wander very far, so I haven’t had to deal with any lost souls! I’ve decided. You are having WAAAAAAY to much fun. Please don’t stop! Dear Salley — Thank you for the peek into your process. So very interesting. I’ve had a wonderful time poring over every detail of hair (and facial hair) styles, plus hats and other garments. The variations you’ve created, even just across the shoulders and along the collar-lines, are delightful! Thanks for checking in Margaret. As you know, making these little characters come alive is the best! Hi Ashley, I hope that you’ve settled into your new house in Vermont. And your Instagram photos are a delight! This is such a cool idea, Salley! I love all the different faces, hair and clothes you’ve managed to achieve. Amazing! The depth of your creativity is astounding. 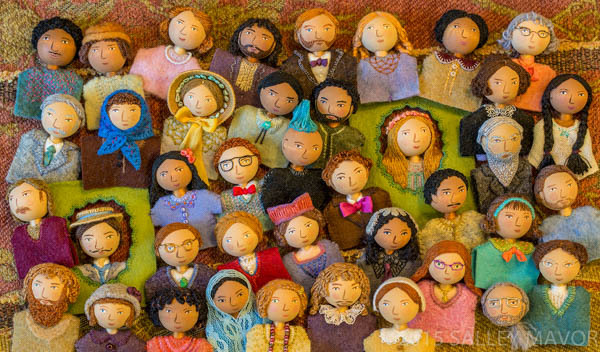 With each new project I think, “This is my favorite!” And then the next felt masterpiece appears. Their faces, and hair, and eyeglasses, and clothing are such fun to study. Then there are all the perfectly pieced frames. Just fabulous!! Thanks Shirley, I’m so glad you’re noticing all of the details! Thank you for this very enjoyable peek into your creative process. I loved looking at all of the different hair and clothing styles. What a treat it would be to see this piece in person. Muy hermoso !!! Te felicito!!! What a fascinating project, my sister is a watercolorist and I am in awe of how these ideas flow from the artist hands and where they inspirations comes from…..I am a quilter but love to see your work, they are so beautiful in person. I loved looking at each of your stitches and how you made them come alive. Happy Sewing and continued success Salley.